Charli XCX performed with special guests Ty Dolla $ign and Tinashe at the 2015 MTV Movie Awards at Nokia Theatre L.A. Live on Sunday (April 12) in Los Angeles, California. 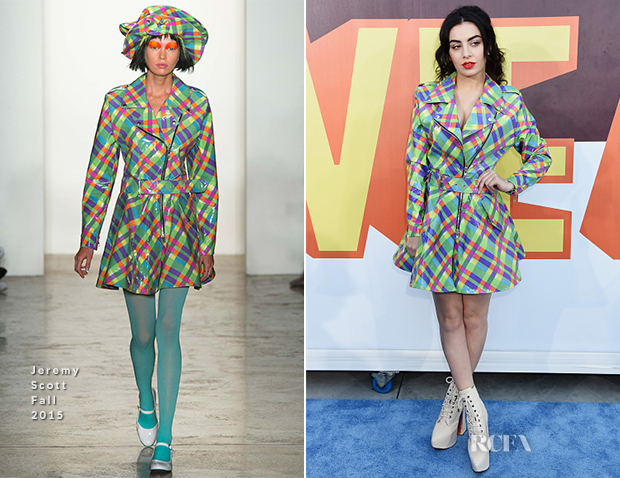 Before hitting the stage, the British songstress took plaid and platforms out for a spin in a Jeremy Scott Fall 2015 plastic raincoat. The twee, rainbow-hued design was rather strikingly juxtaposed to the singer’s raven-black waves and crimson lip. And, that the look was absent its runway hat and teal tights is something to which I will not complain. The mega-clunky, punk-star Vivienne Westwood stripper booties were an unfortunate addition to an otherwise cheeky-cute entrance.